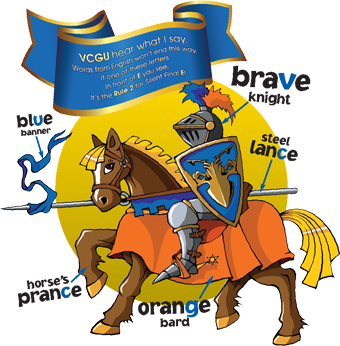 In Levels 1 and 2, Shurley English has assembled a powerful combination of features to help early readers break the reading code. Through a logical, systematic approach, we provide students with the concrete steps necessary to make the connection between letters, their sounds, and the words they make. Our multi-sensory approach ensures a solid foundation for lifetime literacy. Sound Jingles teach phonemic awareness and phonics at the same time. 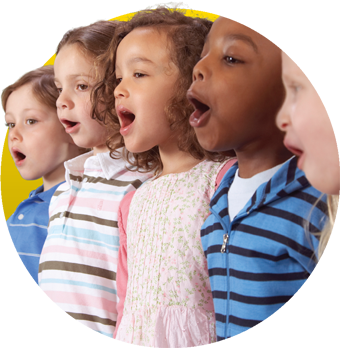 Students begin by learning the Alphabet Jingle, which is not the same as the ABC song. The Alphabet Jingle teaches the phonetic part of the alphabet. The tiny seeds of learning to decode words are in the phonics of the ABCs---in their sounds! As additional Sound Jingles are taught, students begin to internalize the letters of the alphabet and their sounds. These concepts are taught systematically every day until all the sounds have been addressed. provide information about sounds and how they work together. provide definitions to help students decode and analyze words. Shurley English students learn phonemic awareness skills with Sound Cards. Sounds are taught systematically and practiced daily utilizing the Sound Cards. The teacher simply uses the teacher's manual and the Sound Card to deliver instruction. 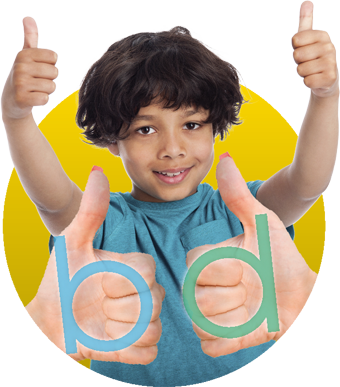 When students know their letters and sounds, they learn how to blend sounds into words, which is the basis for decoding. 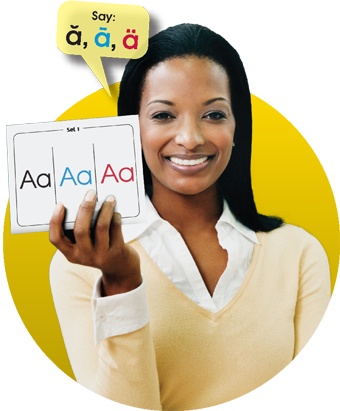 Students learn letter patterns and letter positions easily through practice and repetition. provide a coding system for letters and sounds. 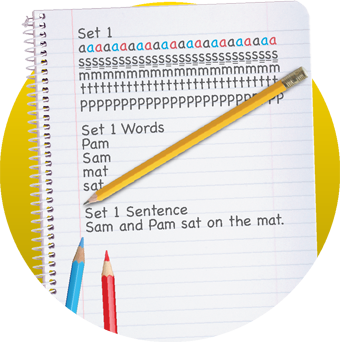 incorporate daily repetition of important phonemic rules. feature detailed instructional information for the teacher. Multi-sensory Techniques are used to internalize skills. In the primary grades, we teach five coding systems: Vowel Color Codes, Line Codes, Circle Codes for Silent Final E, Highlight Code for Multi-letter Phonemes, and Box Codes for letters that sound like another letter and for silent letters other than E. By learning these multi-sensory coding systems, neural connections are strengthened to provide mastery of the sounds and symbols of reading. use repetition and a combination of learning styles. 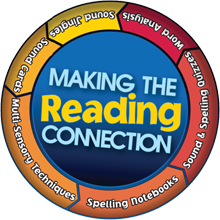 provide ways to master the sounds and symbols of reading. Spelling Notebooks are created by the student throughout the school year and incorporate the numerous multi-sensory decoding strategies that have been taught. This type of experiential learning helps students remember important spelling patterns in words. 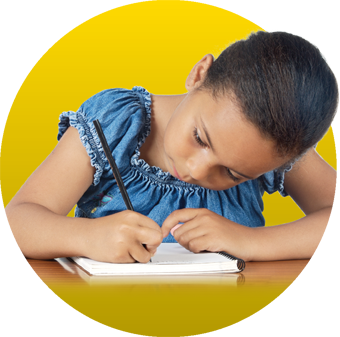 With daily sound quizzes, spelling instruction, and sentence dictation, students learn key literacy skills. provide students with their own self-made vocabulary reference. serve as a study tool for partners and whole groups. show daily progress of students' phonemic awareness. Students participate in a Daily Sound Quiz as soon as new sounds are taught. This routine practice is continued throughout the entire school year. First, the sounds and their symbols are taught and practiced in a multi-sensory way. Then, students demonstrate their mastery of the sounds and symbols (letters) on a daily quiz that is dictated aloud by the teacher. Students quickly learn to stream sounds together as they internalize all of the sounds letters can make. Word attack skills become second-nature to students who recognize the various attributes of letters, their sounds, and how they fit together. The sound and spelling quizzes later evolve into not only a spelling formative assessment, but also into a vocabulary and sentence-sense builder. hold students accountable for old and new material. provide a constant stream of practice. Word Analysis develops as students internalize the Sound Jingles, demonstrate mastery of the Sound Cards and their phonemes, and adopt the Multi-Sensory Techniques that were taught within the five coding systems. This process strengthens neural connections by fusing together visual, auditory, and kinesthetic learning, thereby allowing students to build their own literacy skills. incorporates a coding system that turns invisible decoding strategies into visible, hands-on learning. allows students to build their own literacy from sound-symbols to words. helps students visually recognize spelling patterns. aids reading and writing development.